Friedrich Wilhelm Murnau (born Friedrich Wilhelm Plumpe; December 28, 1888 – March 11, 1931) was a German film director. He was greatly influenced by Schopenhauer, Nietzsche, Shakespeare and Ibsen plays he had seen at the age of 12, and became a friend of director Max Reinhardt. During World War I he served as a company commander at the eastern front and was in the German air force, surviving several crashes without any severe injuries. One of Murnau's acclaimed works is the 1922 film Nosferatu, an adaptation of Bram Stoker's Dracula. Although not a commercial success, owing to copyright issues with Stoker's novel, the film is considered a masterpiece of Expressionist film. He later directed the 1924 film The Last Laugh, as well as a 1926 interpretation of Goethe's Faust. He later emigrated to Hollywood in 1926, where he joined the Fox Studio and made three films: Sunrise (1927), 4 Devils (1928) and City Girl (1930). The first of these three is widely regarded as one of the greatest films ever made. In 1931, Murnau travelled to Bora Bora to make the film Tabu (1931) with documentary film pioneer Robert J. Flaherty, who left after artistic disputes with Murnau, who had to finish the movie on his own. A week prior to the opening of the film Tabu, Murnau died in a Santa Barbara hospital from injuries he had sustained in an automobile accident that occurred along the Pacific Coast Highway near Rincon Beach, southeast of Santa Barbara. Friedrich Wilhelm Plumpe was born in Bielefeld, Province of Westphalia. By the age of seven, he was living in Kassel, northern Hesse. He had two brothers, Bernhard and Robert, and two stepsisters, Ida and Anna. His mother, Otilie Volbracht, was the second wife of his father, Heinrich Plumpe (1847–1914), an owner of a cloth factory in the northwest part of Germany. Their villa was often turned into a stage for little plays, directed by the young Friedrich, who had already read books by Schopenhauer, Nietzsche, Shakespeare and Ibsen plays by the age of 12. Plumpe would take the pseudonym of "Murnau" from the town of that name near Lake Staffel, south of Munich, where he lived for a time. The young Murnau was 6' 4" tall, and was said to have an icy, imperious disposition and an obsession with film. Some reference sources list him as being almost 7 feet tall,  but extant photos show him to be closer to 6'4". Murnau studied philology at the University in Berlin and later art history and literature in Heidelberg, where director Max Reinhardt saw him at a students' performance and decided to invite him to his actor-school. He soon became a friend of Franz Marc (the Blue Rider artist based in Murnau), Else Lasker-Schüler and Hans Ehrenbaum-Degele. In World War I Murnau served as a company commander at the eastern front. He then joined the Imperial German Flying Corps and flew missions in northern France for two years; surviving eight crashes without severe injuries. After landing in Switzerland, he was arrested and interned for the remainder of the war. In his POW camp he was involved with a prisoner theater group and wrote a film script. After World War I ended, Murnau returned to Germany where he soon established his own film studio with actor Conrad Veidt. His first feature-length film, The Boy in Blue, a drama inspired by the famous Thomas Gainsborough painting, was released in 1919. He explored the popular theme of dual personalities, much like Robert Louis Stevenson's Dr. Jekyll and Mr. Hyde, in 1920's Der Janus-Kopf starring Veidt and featuring Bela Lugosi. Murnau's most famous film is Nosferatu, a 1922 adaptation of Bram Stoker's Dracula, starring German stage actor Max Schreck as the vampire Count Orlok. The release would be the only one by Prana Film because the company declared itself bankrupt in order to avoid paying damages to Stoker's estate (acting for the author's widow, Florence Stoker) after the estate won a copyright infringement lawsuit. Apart from awarding damages, the court ordered also all existing prints of the film to be destroyed. However, one copy had already been distributed globally. This print, which has been duplicated time and again by a cult following over the years, has made Nosferatu an early example of a cult film. Also in Murnau's filmography was The Last Laugh ("Der Letzte Mann", German "The Last Man") (1924), written by Carl Mayer (a very prominent figure of the Kammerspielfilm movement) and starring Emil Jannings. The film introduced the subjective point of view camera, where the camera "sees" from the eyes of a character and uses visual style to convey a character's psychological state. It also anticipated the cinéma vérité movement in its subject matter. The film also used the "unchained camera technique", a mix of tracking shots, pans, tilts, and dolly moves. Also, unlike the majority of Murnau's other works, The Last Laugh is considered a Kammerspielfilm with Expressionist elements. Unlike expressionist films, Kammerspielfilme are categorized by their chamber play influence, involving a lack of intricate set designs and story lines / themes regarding social injustice towards the working classes. Murnau was gay. Murnau's last German film was the big budget Faust (1926) with Gösta Ekman as the title character, Emil Jannings as Mephisto and Camilla Horn as Gretchen. Murnau's film draws on older traditions of the legendary tale of Faust as well as on Goethe's classic version. The film is well known for a sequence in which the giant, winged figure of Mephisto hovers over a town sowing the seeds of plague. Nosferatu (music by Hans Erdmann) and Faust (music by Werner R. Heymann) were two of the first films to feature original film scores. Murnau emigrated to Hollywood in 1926, where he joined the Fox Studio and made Sunrise: A Song of Two Humans (1927), a movie often cited by scholars as one of the greatest of all time. Released in the Fox Movietone sound-on-film system (music and sound effects only), Sunrise was not a financial success, but received several Oscars at the very first Academy Awards ceremony in 1929. In winning the Academy Award for Unique and Artistic Production it shared what is now the Best Picture award with the movie Wings. In spite of this, Murnau was financially well off, and purchased a farm in Oregon. Murnau's next two films, the (now lost) 4 Devils (1928) and City Girl (1930), were modified to adapt to the new era of sound film and were not well received. Their poor receptions disillusioned Murnau, and he quit Fox to journey for a while in the South Pacific. Together with documentary film pioneer Robert J. Flaherty, Murnau traveled to Bora Bora to make the film Tabu in 1931. Flaherty left after artistic disputes with Murnau, who had to finish the movie himself. The movie was censored in the United States for its images of bare-breasted Polynesian women. The film was originally shot by cinematographer Floyd Crosby as half-talkie, half-silent, before being fully restored as a silent film — Murnau's preferred medium. A week prior to the opening of the film Tabu, Murnau drove up the Pacific Coast Highway from Los Angeles, California in a hired Rolls-Royce. The young driver, a 14-year-old Filipino servant, crashed the car against an electric pole. Murnau suffered a head injury and died in a hospital the next day, in nearby Santa Barbara, before the premiere of his last film. Murnau was entombed in Southwest Cemetery in Stahnsdorf (Südwest-Kirchhof Stahnsdorf), near Berlin. Only 11 people attended the funeral. Among them were Robert J. Flaherty, Emil Jannings, Greta Garbo and Fritz Lang, who delivered the eulogy. Garbo also commissioned a death mask of Murnau, which she kept on her desk during her years in Hollywood. In July 2015, Murnau's grave was broken into, the remains disturbed and the skull removed by persons unknown. Wax residue was reportedly found at the site, leading some to speculate that candles had been lit, perhaps with an occult or ceremonial significance. As this disturbance was not an isolated incident, the cemetery managers are considering sealing the grave. American author Jim Shepard based his 1998 novel Nosferatu on Murnau's life and films. The book began as a short story from Shepard's 1996 collection Batting Against Castro. In 2000, director E. Elias Merhige released Shadow of the Vampire, a fictionalization of the making of Nosferatu. Murnau is portrayed by John Malkovich. In the film, Murnau is so dedicated to making the film genuine that he actually hires a real vampire (Willem Dafoe) to play Count Orlok. In the fifth season of American Horror Story, subtitled Hotel (2015), Murnau is a mentioned character who, sometime in the early 1920s, travels to the Carpathian Mountains while doing research for the film Nosferatu. There, he discovers a community of vampires, and becomes one himself. After returning to the United States, Murnau turns actor Rudolph Valentino and Natacha Rambova into vampires to preserve their beauty. Valentino later transforms his fictional lover, Elizabeth Johnson, into a vampire, and she goes on to become The Countess, the central antagonist of the season. See also: Category:Films directed by F. W. Murnau. 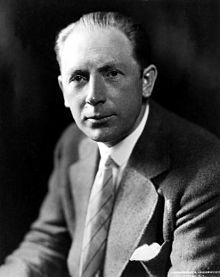 ^ a b "F. W. Murnau Killed in Coast Auto Crash". The New York Times. March 12, 1931. Retrieved 2009-01-22. Movie Director Planned to Go Home to Germany After Making South Seas Film. F.W. Murnau, German and American moving picture director, died this morning in a local hospital from injuries received in an automobile accident yesterday afternoon on the Coast Highway north of here. ^ "Votes for Sunrise A Song of Two Humans (1927)". British Film Institute. 2012. Retrieved October 3, 2016. ^ a b c "F. W. Murnau". TCM. Archived from the original on July 21, 2015. ^ "Plumpe, Heinrich" (in German). www.deutsche-biographie.de. Retrieved December 28, 2017. ^ a b "Friedrich Wilhelm Murnau". internettrash.com. Archived from the original on March 24, 2005. ^ Hergemöller, Bernd-Ulrich (2010). Mann für Mann. LIT Verlag. ISBN 978-3643106933. ^ Room, Adrian (2012). Dictionary of Pseudonyms: 13,000 Assumed Names and Their Origins (5 ed.). McFarland. p. 340. ISBN 9780786457632. ^ "F. W. Murnau Height". www.celebheights.com. ^ a b c Eisner, Lotte H. (1973). Murnau. University of California Press. ISBN 978-0520022850. ^ "F.W. Murnau". www.allmovie.com. Retrieved December 28, 2017. ^ "F. W. Murnau" (in German). www.filmportal.de. Retrieved December 28, 2017. ^ Hall, Phil. "THE BOOTLEG FILES: "NOSFERATU"". Film Threat. Retrieved 29 April 2013. ^ Brockmann, Stephen (2015). A critical history of German film. Camden House. ISBN 1-571134689. ^ Isenberg, Noah (2009). Weimar Cinema : an essential guide to classic films of the era. Columbia University Press. ISBN 0-231130546. ^ "Sunrise: A Song of Two Humans (1927)". Turner Classic Movies. Retrieved 20 April 2016. ^ DiMare, Phillip C., ed. (2011). Movies in American History: An Encyclopedia [3 volumes]: An Encyclopedia. ABC-CLIO. p. 755. ^ fionapleasance. "Tabu: A Story of the South Seas". Mostly Film. Retrieved 17 October 2018. ^ Friederich Wilhelm Murnau. Nosferatumovie.com. Accessed from August 8, 2012. ^ "'Nosferatu' director F.W. Murnau's skull stolen by grave robber". Mercury News. Associated Press. 15 July 2015. Retrieved 28 January 2018. ^ Wilson, Scott. Resting Places: The Burial Sites of More Than 14,000 Famous Persons, 3d ed. : 2 (Kindle Locations 33926-33927). McFarland & Company, Inc., Publishers. Kindle Edition. ^ "Nosferatu director's skull believed stolen". BBC News. Retrieved 15 July 2015. ^ "Nosferatu director's head stolen from grave in Germany". Guardian News. Retrieved 15 July 2015. ^ Atkinson, Michael (26 January 2001). "The truth about film-maker FW Murnau". The Guardian. Retrieved 27 January 2018. ^ Bernstein, Richard. (March 25, 1998) "'Nosferatu': The Imagined Life of a Film Pioneer," The New York Times. Retrieved on July 10, 2016.